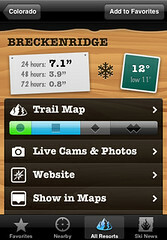 David Watanabe's DWBlog » Blog Archive » Introducing Ski Lodge for iPhone! Introducing Ski Lodge for iPhone! When I’m not writing code, you can often find me out in the wilds of British Columbia on my mountain bike in the summer or on the ski slopes during the winter. So, when I got my iPhone earlier this year it wasn’t long before an idea began to form about a user experience for the iPhone that would embrace and enhance the winter mountain lifestyle. This would be a niche product, for sure, but it’s a niche that I am passionate about. So, I’m pleased today that this product is now a reality, having wound its way through the wilderness of the App Store review process. Today I’m introducing Ski Lodge (iTunes direct link), the ultimate companion experience for skiers and snowboarders alike. Ski Lodge brings together a plethora of interesting information on nearly 400 resorts in North America (Europe and the Southern Hemisphere coming soon!). First and foremost is constantly updated snow reports, along with live temperature data and resort cams, so you’ll know at a glance when to hit the slopes and when to stay home. Once you’re on the slopes, trail maps for every single resort are a tap away, fully zoomable and scrollable as you’d expect. The features of this app are all wrapped within a lush experience, the most graphically rich one I’ve designed to date. The experience begins at your ‘Favorites’ list, where you can see snowfall and weather conditions for your hand-picked list of resorts. 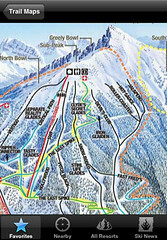 You can then drill down into each resort to get more detailed information such as the photos and trail map (complete with a cute graphical gauge showing you the relative number of green, blue, black, and double black runs on the hill). Naturally I wanted Ski Lodge to be something that was something iPhone users could be proud of, and part of that is taking advantage of the iPhone’s unique capabilities. Case in point, Ski Lodge uses the iPhone’s GPS support to quickly show all the ski resorts in your geographic vicinity – great for when you’re in new surroundings or just as a way to use the app with zero configuration. Ski Lodge also integrates well with other iPhone apps. Each resort has a button that sends the resort’s geoposition to the Maps app, so you can get a satellite view or driving directions. And the iPhone is a phone after all, so each resort gives you a button that you can use to call the resort’s info line, for those times you need a human voice (or you need to call the ski patrol!). As a final cherry-on-the-top feature (more for fun and not really central to the app), Ski Lodge has a sampling of ski news, where you can spend some time seeing what’s happening all around the ski universe. For those who are interested, this news section is actually a stripped down, purpose-built, ‘lite’ version of NewsFire for iPhone, so this is your chance to get a sneak peak of that. The challenge here will be finding good blogs to feature – if you know of one you’d like included, please let me know. So, please give it a try and let me know what you think! I’m committed to pushing the user experience of this forwards over the coming weeks, but I think this is a solid start. Note: If you are a blogger/media and would like to write about Ski Lodge, please send an email to get a free promo code for Ski Lodge. When I saw this yesterday I had to pick it up despite there not being any reviews on iTunes yet (something I haven’t done before). After poking around a bit I’m happy to say this looks like a great little app. Everything is presented with such a consistenet style, it makes me want to get out and hit the slopes right now. The only two gripes I could see were that this is limited to NA and I’m now living in the UK, and also that the PDF trail maps can be a bit slow to use (not to download specifically, but once it’s loaded, zooming in and out seems to freeze for a bit). All in all though looks like a great well thought out and well timed app. Hoping to see some more well designed items from you in the future. Shame I’m not a skier really. True Weather/Forecast info. The only “weather” i see on there is the snowfall, which only shows 3 categories of inches. I have to know the forecast, sunny, cloudy, temp, or precipitation, so I know how to dress before I go out. Projected Snowfall info. I’m not sure how you can get this info, or where, but I know with the Canyons website, they provide text on their homepage about upcoming snow storms. This is HUGE for a devoted skier. Gorgeous App. Organized well. Smooth and fast. Trail maps is the best implementation I’ve seen. 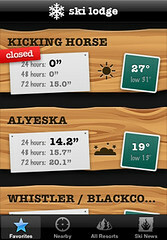 I’ve tried about 3 other Ski info apps, and this is the best. High Quality and it works well. You definetly know how to design an iPhone App, I’m astonished! Hey, that looks amazing. Kudos to your designer! And, the trail maps were a nice touch. Must have been a chore to acquire them all. Congratulations! This is by far the most beatifully constructed ski app released on the App Store thus far. The UI is very nice to use and the trail map is lovely to navigate. I must suggest for you a few ways you could make the app even better in the future, which I hope you appreciate. Quite simpy, most punters would really enjoy having more detailed weather forecast and some data on the number of lifts/trails open. You should by no means should add the level of detail of Snocator, as the concept should always be a widget to quickly access important information. I shall be eagerly spying Ski Lodge until I hit up Jackson Hole in February! I’m curious, did you to the graphic design yourself or did you pay someone? If you didn’t do it yourself, any recommendations? The problem appears to be a bug where toggling between the two display options in the Settings app fixes it. Thanks for the emails, Dave. Right now, the app shows me info in celcius and centimeters, but yo no hablo metric system… How do I change this?